François-Marie Arouet, better known as Voltaire, is the principal representative of the Age of Enlightenment. He fought passionately against dogmatism of any kind, advocated free speech, was censored, imprisoned and exiled multiple times. His 18th-century wits are far from archaic even today. The ridicule of organized religion and Leibniz’s philosophy of Optimism, as presented in Candide, is entertaining and punchy. To a modern reader, Candide is no less exciting and sharp than South Park or John Oliver might be at ridiculing today’s world. Unusually for a philosopher of the time, Voltaire was a celebrity and rather wealthy his whole life. Born into a family of a well-established lawyer father, he later came to possess what would today be deemed as f**k-you-money. This certainly helped Voltaire maintain his standpoints and never compromise on his ideals of critical thought and free speech. Although often incorrectly credited with writing: “I disapprove of what you say, but I will defend to the death your right to say it.”, the quote was made up in order to summarize Voltaire’s firm attitude on freedom of thought. Today, Voltaire’s best-known work is Candide. It is a story of a naive man that travels the world, meets people and discovers misery of the real world through their unfortunate life stories. After being kicked out from the shelter of his castle, all Candide sees in the world is opposite to what he was taught. His teacher, Professor Pangloss, is a personification of Leibniz’s philosophy of Optimism and a man of firm beliefs, often irrational and obviously wrong. Besides the criticism of all organized religions and the optimistic philosophy, a few motifs stand out in Candide, pointing out behaviors that Voltaire particularly condemned. The philosophy of Optimism, attributed to Gottfried Wilhelm Leibniz, holds that we live in a world that was designed as it is, on purpose, and it is “the best of all possible worlds”. Voltaire’s main argument against Optimism is that there is simply too much suffering in the world, and it could obviously have been designed to include less misery. Candide, a naive man, who was “educated never to judge for himself”, needs to live through a long string of unfortunate events to merely start doubting the optimistic teachings of Prof. Pangloss. On the other hand Prof. Pangloss, a philosopher, even after being hanged, dissected alive, beaten and made to row a galley still holds on to Leibniz’s teachings. The whole enlightenment philosophy is built on strong trust in the power of the human mind and its ability for humble critical thinking. Voltaire was hostile not only towards any form of authority, such as religion and tradition, but also towards philosophical tradition of building systems that simply don’t stand the test of reality. Voltaire was particularly unhappy with Descartes, whose works he calls out as completely wrong and useless. He criticizes the urge for what he calls “philosophical romances” – systematic accounts of natural phenomena that serve only to satisfy our natural need for coherent explanations. Such systems, rooted in imagination, are often cumbersome and wrong in the face of evidence. Voltaire calls for a more humble stance – sometimes to offer no explanation is the most honest thing to do. In this, he was strongly influenced by Newton, who succeeded in describing how physical bodies moved, but when asked about why the laws are the way they are, he famously replied: “I feign no hypotheses“. 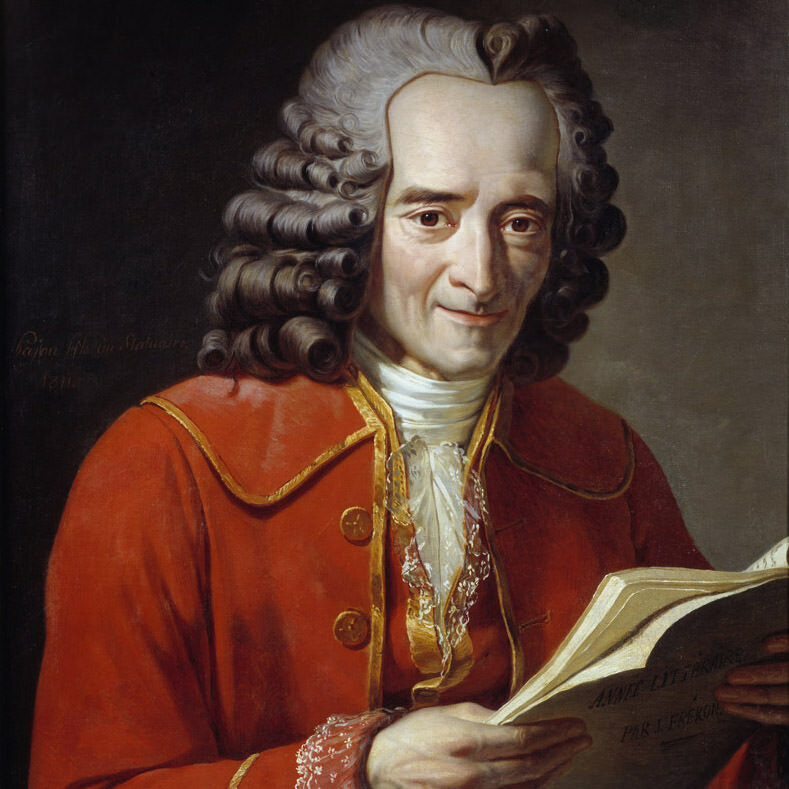 Voltaire believed in work, himself having written 20,000 letters and 2,000 books and pamphlets. He thought of himself as “writing to act”, wanting for his works to influence thinking and behavior of people. His view of philosophy and the role of a philosopher was first and foremost as that of a public citizen and advocate of reason. He measured the quality of a philosophy by its ability to make social impact. When Candide and Martin visit Lord Pococuranté, they meet a perfectionist displeased by everything around him. Right or wrong in his attitude, Pococuranté presents a view radically different to what Candide was taught. And that is exactly what Voltaire and the Enlightenment were about – thinking for yourself. Pococuranté’s shelves are full of classics such as Homer, Horace, Cicero, Milton, and proceedings of an academy of science. All huge works, but Pococuranté finds them mostly boring and only partially useful. His opinion goes strongly against the usual unquestioned admiration. As mentioned earlier, Voltaire sees Descartes’ philosophy as obsolete. As such he’s not hesitant to observe that “Very few people in England read Descartes, whose works indeed are now useless.” Perhaps to emphasize his standpoint, he takes his attitude to the extreme. Today, most philosophies of the past are obsolete, but we usually see them either as stepping stones for something more sensible or as a valuable historical record of the times. We rarely dismiss them as useless. “Fools admire everything a poet of reputation writes. I read only for myself; what I love is only what I can use.’’ Candide, who had not been raised ever to judge anything for himself, was astonished to hear such things. But in Voltaire’s defense, and at the risk of stretching the point, his attitude towards classics feels liberating when taken against a modern man’s to-read list. Today, getting a book is easier than ever and we’re flooded with bestsellers promising to change your life and shatter everything you’ve known. However, more than a few times I struggled to finish reading a critically acclaimed book. Badly written books bring out the point early on and then circle around it for another 300 pages. Some of the greatest books ever written convey a message that you’re simply not interested in. Some are relevant only because of the context in which they were written and the status quo they challenged at the time of publishing. Once you realize that there is rarely a universally great book, it helps you find the ones that are the best for you, and only you can judge that. The session lasted until four o’clock in the morning. Listening to all their stories, Candide reminded himself of what the old woman told him, as they were sailing to Buenos Aires, and the bet she’d made, that there wouldn’t be a single person on board the vessel who hadn’t experienced immense misfortune. And he also thought of Pangloss, as he heard each life history. To make his case stronger, Voltaire has Candide meet ten kings, all dethroned and exiled, each one less wealthy than Candide and secretly admiring him. He meets Lord Pococuranté, a rich man who has everything he wished for, but is still restlessly unhappy.